Height 25 – 30cm (10 – 12in). Average lifespan 12 – 15 years. Temperament Very intelligent, versatile, and loyal. With his endearing fox-like face and extreme intelligence, the Corgi really does prove that the best things come in small packages. Grooming requirements: Corgis have thick undercoats with longer, fluffy outer coats, though they are self-maintaining and should only require brushing once a week. Good with other pets? Yes; they are good with a variety of animals from cats to sheep. Type of house needed: Happy in a small home, as long as they have plenty of exercise. Dog activities: They are capable of a wide range of activities. As its name suggests, the breed originates from Pembrokeshire in Wales as far back as 900AD, and it is said that they were used as herding dogs to round up livestock. The breed’s name refers to its size and translates from the Welsh for ‘dwarf dog’. Pembrokes were first shown in 1925 and were recognised by the Kennel Club in 1928. The Corgi is most commonly associated with Queen Elizabeth II, who admires the breed and has owned many throughout her life. However, from 2007, the Corgi’s popularity diminished, with registration figures plummeting to a mere 274 by 2014, until the breed found itself on the KC’s ‘Native vulnerable breeds list’ for the first time in its history. Today, the Pembroke appears on the ‘At watch list’, as registration figures have risen over 300. Social media has had a part to play in this, with owners making personal accounts for their Corgis and bringing this larger-than-life breed to the forefront once again. The popularity of the Pembroke has fluctuated over the years, which is surprising for a such an all-round breed. Although they are small, they are certainly not your typical lapdog; they are a larger-than-life breed with enthusiasm and a desire to please. They are very people orientated and, because of this, are a great addition to any family — anything is possible with a Pembroke. The Corgi’s desire for constant stimulation stems from its herding instincts, which requires the breed to be constantly on the ball. These dogs have been known to carry these traits into home life and try to round up family members — though with a good level of training, this shouldn’t cause any problems. Pembrokes are extremely versatile and will adjust to different lifestyles, making them suitable for most families, even those with less dog experience. Margaret says: “They’ll adapt well to any home situation. They’re able to live with children and other animals, including cats, other dogs, and horses — I even know someone whose Corgi gets along quite happily with sheep. Despite the breed’s extreme intelligence and versatility, the Corgi is not as popular as some of the other pastoral breeds. Last year, puppy registration figures stood at 393. Agility: Corgis make excellent agility dogs due to their alertness and ability to pick up commands quickly. Although they have little legs, Corgis were bred to herd, so they are actually incredibly strong and athletic, making them perfectly suited to jumping, weaving, and climbing. Most agility groups will run classes suited to smaller breeds. Obedience trials: The extreme intelligence of the Corgi, likened to the IQ of a five-year-old child, makes these dogs perfect for obedience; they enjoy discipline and like to have something to focus on. The best way to get started in obedience is to look for a Kennel Club-accredited training group, where you’ll be able to work through the different levels and progress up to competitive obedience. Flyball: Pembrokes love to chase, especially balls, so flyball seems especially fitting. It is also suitable for smaller dogs as the hurdles remain the same height across all classes (12in), and it’s a fantastic way of enabling your Corgi to run off some steam in a fun and enthusiastic environment. If you want to get involved, visit the Kennel Club’s website (www.thekennelclub.org.uk) to find a club in your area. Trekking: Corgis make great trekking companions as they can walk for miles and miles. If you’re wanting to get out and explore more of the UK, then coast-to-coast walking might be for you, and will keep both you and your Corgi happy and healthy. If you have a young Corgi it is advisable to wait until they are fully mature, and if you have an older dog then it is important to check your dog’s fitness beforehand. Tracking: This activity requires a dog to use his nose to find a specific object. Corgis are independent thinkers and will use this ability when herding; the same techniques can be applied when tracking. 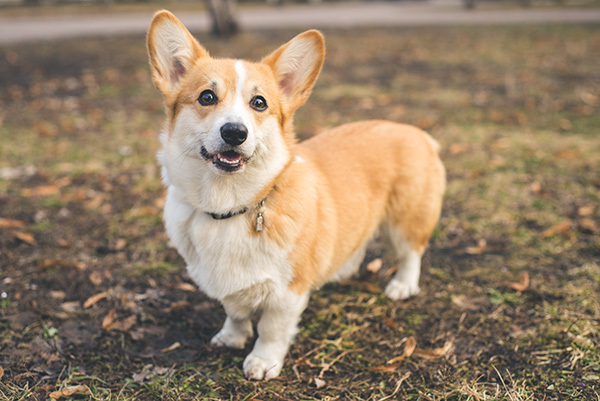 Like the Pembroke Welsh Corgi, the Cardigan Welsh Corgi is intelligent, devoted, and friendly, although said not to be as outgoing as the Pembroke. The main difference is the Cardigans’ appearance as they have much thicker coats and a more fox-like tail.